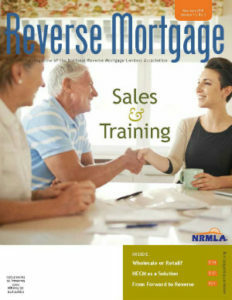 Loan originators and business owners will find the May-June 2018 issue of NRMLA’s award-winning Reverse Mortgage magazine a helpful resource because it addresses two vital issues critical to any lender’s success: sales and training. While many forward mortgage lenders struggle to succeed in the reverse mortgage business, Scott Harmes, reverse mortgage manager at C2 Financial in San Diego, has successfully implemented a training program for forward mortgage loan originators that has helped his company quadruple its production volumes. Harmes talks about his C2 reverse mortgage certification program and how forward lenders should approach the reverse mortgage business with associate editor Darryl Hicks.